Silica is a popular option for use in “HILIC” mode, but developing new methods can be difficult because the retention patterns are so different from C18. 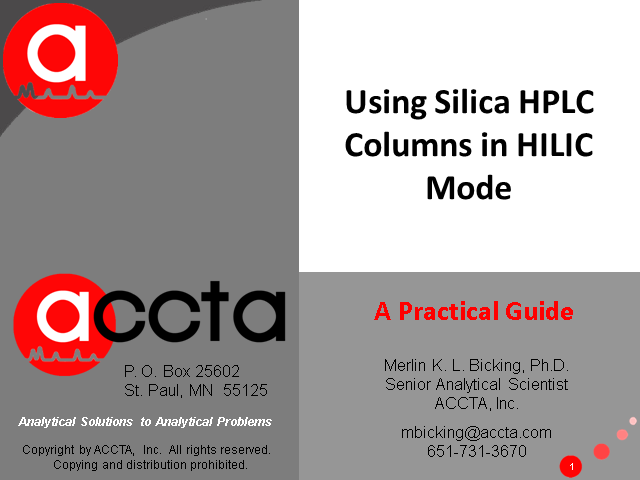 This presentation will provide some practical guidelines for using silica in a HILIC mode – with buffer/acetonitrile mobile phases. Some compound classes are retained under these conditions, and some are not. We will discuss which compounds are good candidates for this system, and summarize how to get started with your method development experiments. •What compounds can be separated on silica in HILIC mode, and what compounds cannot be separated. •Starting points for separations, and suggestions for how to adjust conditions for your separation problem. •Advantages and limitations of silica in this mode. Merlin K. L. Bicking, Ph.D. Presented by: Merlin K. L. Bicking, Ph.D.